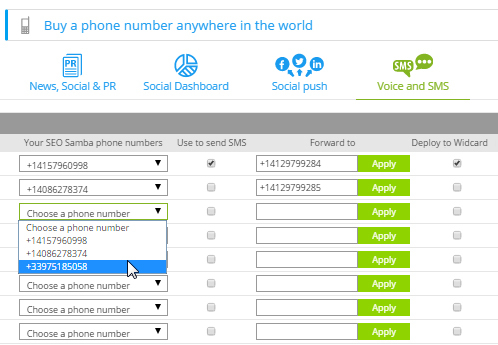 Forward a number to your office or smartphone, press 1 button from your dashboard, and SeoSamba replaces your website's displayed phone number with a tracked number. Once you log in to your account, you can add, remove, and edit your lead-generating and geolocated phone numbers, quickly and easily . Simply select the pre-purchased phone number to use, associate it with any existing business number - whether landline or cellphone - then apply your changes. When SeoToaster CMS powers your website, you can even deploy that number to your websites in 1-click while your sales staff get SMS notifications anytime a contact is made via one of your website forms. Thanks to SeoSamba's cloud platform, your lead tracking solution is available 24/7 from anywhere in the world. Whether you are safely tucked in your New York office, on the road to an unexpected sales event or laying low on a sunny Florida beach, as long as you have the internet you are able to track and review all phone calls that have been made on your SeoSamba phone number. Every call made through your SeoSamba phone number is entirely recorded, while originating number, and geographic location is captured, so you can review them at your convenience. Managers can easily monitor inbound support & sales call activity - both quantitatively and qualitatively - and take further actions to funnel prospects through your existing sales process or adjust marketing activities. SeoSamba also logs inbound web form contact messages and even purchases from your webstore. Marketing agencies can white-label SeoSamba to manage multiple clients and campaigns with an agency account. 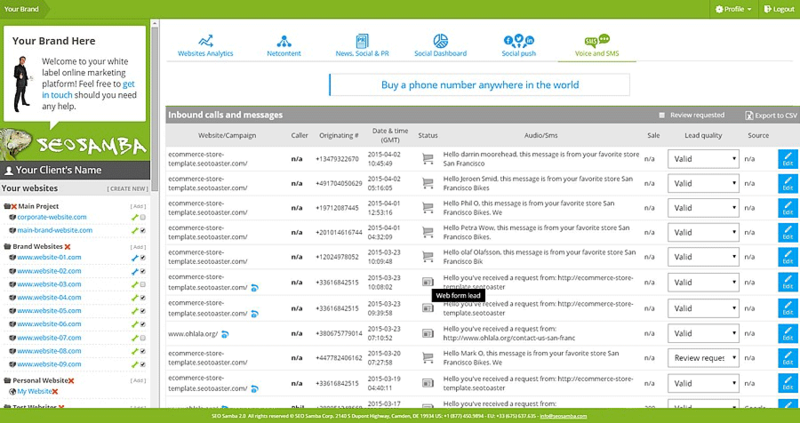 Thanks to SeoSamba's cloud platform, you can track your inbound phone calls, web form contact messages and purchases from your webstore 24/7 from anywhere in the world.